Though not my preference, I start with work because it is the changes there that have led to the other changes in my life. There have been four (now five) positions on my team for which I have been recruiting. Anyone who has ever done hiring will understand how much of an effort that can be, with all running nearly simultaneously! My first hire is a former employee of mine, and a good friend. He was able to come in and hit the ground running … for a week, at which point he went on vacation! (He will not soon live that one down, believe me!) But, just having him on the team provided so much mental relief that I was finally able to take a deep breath. The occasional night of not bringing work home now seemed much more possible! My next hire starts this week, but is already in regular contact, doing research and asking questions. He will be a brilliant addition to the team, and will fill out the last of the lead positions on my team. The third opening has two excellent finalists, and the final posted position has a temp doing the work who is an excellent addition to the team and has a high potential for hiring. Just knowing the team is nearly complete, and the new members have such high potential, is like coming out of a tunnel and seeing the sun shining on green fields! With some of the burden slowly lifting at work, and the onset of Spring bringing more daylight and pleasant weather, I can turn more attention to things at home. The weeds, as every year, have gotten a head-start … but I will catch up, as always. As I mentioned in my last post, we were able to get new sand in the arena. Some evenings I come home, jump on the tractor, and push it all around. It’s been usable for a couple of weeks now, but I still have deep and shallow spots to even out. Having paid to have this work done, in the past, it’s rather fun being able to do it myself. New trailer and the first load of hay! Perhaps the biggest change at home, facilitated by a recent raise and some tax refund money, came last weekend. 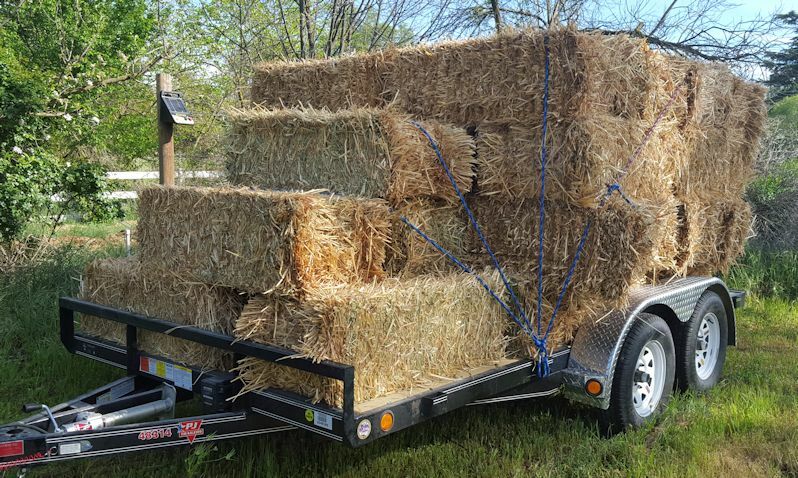 We finally broke down and purchased a trailer for hauling hay. No more weekly truck loads to feed our crew. With this new trailer, we can haul enough for the month in one load. It also means that it’s worth the drive to the hay dealer, where we’ll save enough on the hay to pay for the trailer in less than a year! Besides, it has to be some form of “elder abuse” when your 77 year old mother is unloading a half ton of hay a week, right? Ah well, it has kept her freakishly strong! Nash beginning to settle into the long reins. Nash and Coffee were not well pleased with the additional precision required in the lungeing, but soon settled into it. We’re now working in long reins (or long lining, to some) with both. The long reins are exposing some of the issues with Nash – namely that he’s not comfortable when he’s asked to turn so that I’m on the side of his bad eye. He never exhibited issues on the lunge, but I suspect it’s because he knows that’s where I am, and I’m always in the center. On the long reins, I may ask him to move from the left to the right, which means that I appear and disappear. I have been surprised at how much of an issue this is, but it helps explain my accident last November. He seems only secure when he either can see us or knows just where we are. If I can conquer this trust issue on the ground, then we may have a future under saddle after all. Coffee, of course, remains the star of the barn. 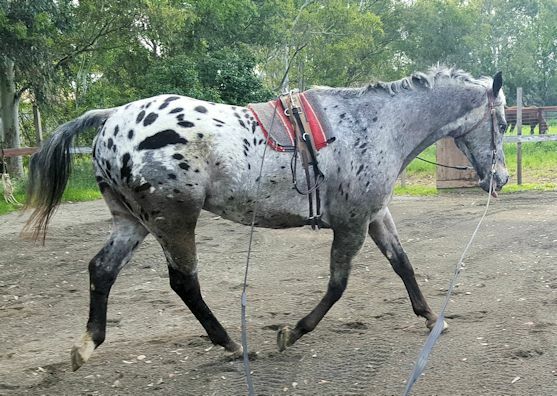 This horse learns at a rate that could make your head spin! It also means that he thinks too much, and we still find ourselves with opposite opinions, at times. However, in his first long reining session, he was already getting the concept of lateral work! He is clearly now very sound, and his movement has gotten very fluid. No longer the shuffling Western Pleasure horse I brought home! If we all stay well, this year should show rapid progress for Mr. Coffee! Tally is still struggling to focus and learn – but even she is showing progress. Today, for the first time in a long time (possibly ever) we had a drama-free session. Even when Noble and Java came running over to watch, it only resulted in a tense halt … but no explosion. In fact, as soon as we returned to work we had a dance, in the best sense of the word. I would ask her to turn toward me, then release and step toward her to get a “leg yield” out … softly in, softly out … flowing like two dancers, fully in tune to each other. Maybe there’s hope for this big girl yet. Noble is still my best boy – and still growing. We’ve just started groundwork again, and he’s as sharp and perceptive a student as Coffee. He already focuses and flows with me as well as Tally at her best – and he’s had far less practice. He’s beginning to take on a rather statesmanlike demeanor at times – giving me glimpses of the amazing adult he could become. I’m back to enjoying each day’s interactions with the horses, instead of feeling guilt for only having time for a scratch and a carrot – and it’s a great feeling! Hopefully all of this progress will continue, and I will have more updates, more opinions, more stories, and more knowledge to share on these pages. Thank you to all who have read my past posts, and who are patient enough to stick around! This entry was posted in My Journey and tagged Coffee, hay, horses, Nash, Noble, progress, sand, Spring, Tally, trailer, work. Bookmark the permalink.